Manufactured by the company that made reciprocating saws a household name (ever heard of Sawzall? ), the 2625-20 M18 Hackzall does not really need to prove much else. It delivers as much superior performance as it is small. The purpose of this review is to get you acquainted with what makes the 2625-20 M18 Hackzall a good choice of compact recip saw. We hope this helps you decide on which saw to get for your shop. The LED light is a nice touch that helps a lot. The anti-vibration system is a good feature. When we were starting out in remodeling, we often encountered big cutting jobs that we thought required the use of full-length reciprocating saws. A lot of it later turned out to be overkill, like shooting at an ant with a cannonball. We realized this when we experienced using the 2625-20 M18 Hackzall. It is so powerful that although it is not recommended for heavy-duty work, it sure can take on cutting jobs of maybe upper moderate difficulty. Since we started using this recip from Milwaukee, we did not feel the need to reach for our full-length recips as often as before. The 2625-20 M18 Hackzall is for any handyman or professional contractor who works on a lot of projects that do not require heavy-duty cutting. It is compact but comes with a variable speed of 0-3,000 spm with ¾-in strokes. For added ease of use, there is a Quik-Lok blade clamp, an LED, and a dual-gear anti-vibration system. Although the 2625-20 M18 Hackzall’s features are more or less basic, it looks like Milwaukee got the balance right because the recip’s performance sets it apart from other compact saws. We have used it to prune fruit trees, cut pipes, chop up large panels of reinforced steel, and more, and it is still working wonderfully today. Sometimes, we wonder if we are abusing it, but it looks like the 2625-20 M18 Hackzall was designed for that kind of tool owner. A recip saw can cut through metal sheets and thick steel pipes and posts. There are just some techniques you have to apply to make sure you do not end up damaging your saw or causing unintended cuts in your material. When cutting metal, the lower the cutting speed and the more teeth your blade has, the better. Your recip will be safe from overheating this way. If the sheet you are cutting is too thin, place it between two sheets of plywood and cut. That way, the sheet metal will not sustain tears caused by the aggressive cutting. There are times you have to align studs with the floor during construction and renovation work. You can make a flush cut to trim excess material and get the studs to align correctly. You can also remove framing or studs by cutting through the nails beneath. If you do have to cut through studs, you can do so using a makeshift guide block for a nice cut. Reciprocating saws do a great job of making plunge cuts. Instead of drilling a starter hole through the material, you can just tip the saw blade towards the surface and cut from there. Cutting through drywall is tricky because the material is thin and often have a lot of wires behind that you have to avoid. You can work around this by trimming your saw blade to match the drywall’s thickness. That way, you can cut freely without worrying about hitting wiring or studs beneath. Milwaukee’s 2625-20 M18 Hackzall is super lightweight, weighing only 4.4 lbs. It is also quite compact, being only 13.4 in long. Its size and weight make it highly portable and easy to use especially when cutting overhead. It has a variable speed range of 0-3,000 spm and a stroke length of ¾ in, letting it cut relatively more precisely and quickly than saws with longer strokes. Meanwhile, it has a Quik-Lok blade clamp that makes blade changes easier and a built-in LED bulb that improves visibility. There is also a dual-gear anti-vibration system to reduce fatigue during use and improve cutting accuracy. The 2625-20 M18 Hackzall does not have a cord, giving it full maneuverability. You can cut in tight or narrow areas even at odd angles without the hindrance of a cord. Another advantage to using a cordless recip like the 2625-20 M18 Hackzall is that you can use it even in remote areas without having to worry about power outlets, extension cords, and generators. Vibration may not sound like a big deal, but it can make all the difference when you are already cutting. The 2625-20 M18 Hackzall has a dual-gear anti-vibration system that reduces the amount of vibration that gets transferred from the recip to your hand. Less vibration means you get more stability, make precise cuts, and experience less stress or fatigue. Since the 2625-20 M18 Hackzall is small and light, storage should not be an issue. You can carry it on you or in a backpack and transport it anywhere without even noticing its weight. The 2625-20 M18 Hackzall has variable speed control, letting you adjust your cutting speed to match your material or to achieve your preferred cut. You can speed it up to make faster, more aggressive cuts or slow it down to cut denser materials without overheating the tool. The speed control trigger is conveniently located under the handle where your index finger can easily press it. The trigger’s accessibility gives you direct speed control and lets you adjust without having to take your eyes off the blade. We went over the many reviews garnered by the 2625-20 M18 Hackzall to see how it served other users. Most (and we mean MOST!) of the reviews were so good that they ultimately pushed us to buy the 2625-20 M18 Hackzall. We think that says a great deal about how great this recip saw is. Many of the customers comment on how versatile the saw is, being able to cut a huge variety of materials (including an entire car, in one customer’s case). There were not a lot of complaints. There was negative feedback about battery and product life, warranty, and related matters but none of them was repeated, leading us to think that those may have been isolated issues. There was a comment about how a little water in PVC piping caused the 2625-20 M18 Hackzall to stall. We do consider that a minus because as a saw used to cut pipes a lot, this product should be able to withstand a little water. Overall, the 2625-20 M18 Hackzall appears to have won many power tool-loving hearts. It is a good match for anyone looking for a compact recip that does the job superbly. Makita’s XRJ01Z has a half-inch stroke length, which is slightly shorter than that of the 2625-20 M18 Hackzall, and a variable no-load speed range of 0-3,000 spm. With a tool-free blade change mechanism, downtime is greatly reduced and you get to change blades more easily. Like the 2625-20 M18, the XRJ01Z has a built-in LED bulb for improved visibility. It has a soft-grip rubber handle that is ergonomically designed to delay the onset of fatigue during extended work periods and gives you better cutting control. Lastly, there is a dual-position power trigger that lets you switch operation modes more easily. The PCC670B recip saw from Porter Cable cuts at a variable speed of 0-3,000 spm with 1-in strokes, making it an ideal tool for making fast and rugged cuts on a large selection of materials. It has a contoured, overmolded handle that improves grip and helps lessen the vibration that gets to your hand, which in turn improves cutting accuracy. The speed trigger is also located on the handle, where you can control it more easily. There is a tool-free blade release system to make blade switching easier, and a pivoting shoe that lets the recip be in contact with the material while cutting. The BDCR20B also has basic features but performs excellently. This compact recip saw comes with a tool-free blade change mechanism that adds convenience, a variable speed trigger that can cut any material efficiently, and a pivoting shoe that helps steady the recip against the material. It has variable speed control, ranging from 0 to 3,000 spm and cutting with ⅞-in strokes. The unique feature of the DCS387B is the multi-position blade clamp that enables you to make flush cuts, especially when you have to cut a pipe against a flat surface. Its no-load cutting speed is just slightly lower than that of the 2625-20 M18 Hackzall at 0-2,900 spm. Finally, like the 2625-20 M18 Hackzall, the DCS387B has an LED bulb and is designed to be slim, sleek, compact, and portable. 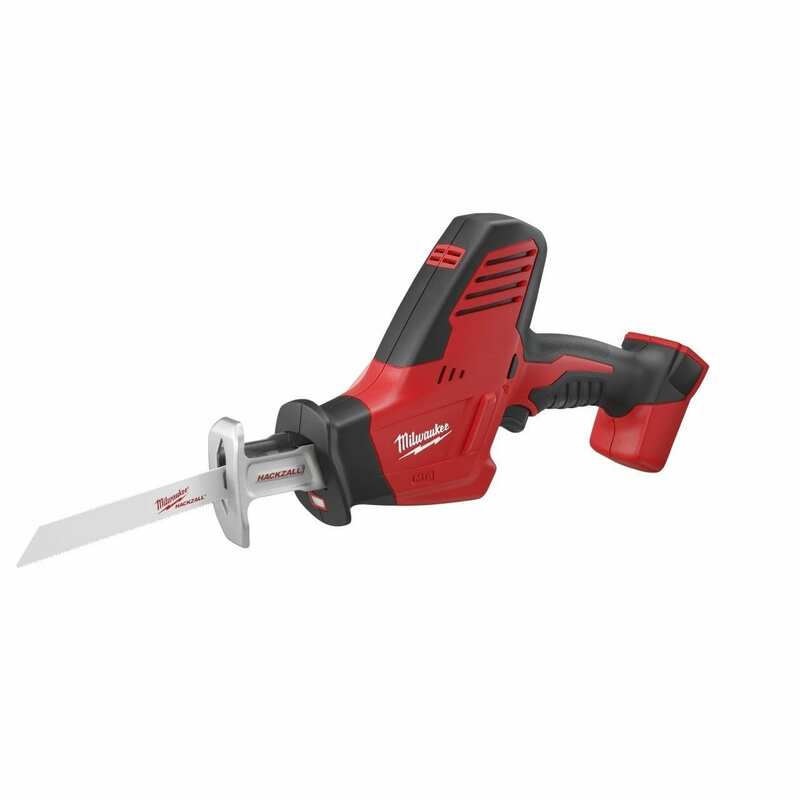 The P514 has an electric brake that stops the blade, letting you cut safely. The speed range is 0-3,100 spm, which is the highest speed for recip saws. It has a specialized tool clamp that enables tool-free blade changing and an overmolded front grip and handle that improves grip, control, and comfort. It also has a pivoting shoe that lets you cut with more stability. Before heading out to buy a full-length reciprocating saw, you first have to make sure that it can’t be done by the small but powerful 2625-20 M18 Hackzall. With a variable speed of 0-3,000 spm and a stroke length of ¾ in, it can cut anything from thin sheet metals to dense woods and steel posts and pipes. Furthermore, it is cordless so you can bring and use it anywhere for as long as you have a spare battery. The 2625-20 M18 Hackzall has an LED bulb and an anti-vibration feature, which are small features that do a lot but unfortunately get missed by many recip saw manufacturers.